January 20-- Mr. Elton Royce Clark, age 81, beloved husband of the late Rachael Wyatt Clark of Soperton passed away at the home of his son on Saturday morning, January 19, 2019. Born in Montgomery County he was one of six sons born to the late Herbert Franklin and Lovie Fordham Clark. As a young child his family lived in the Long Pond Community. They later moved to the Orianna Community of Treutlen County. He farmed with his father for a number of years before becoming a Barber. Mr. Clark cut hair in Dublin for a few years before opening a Beauty and Barber shop with his wife, Rachael, which they ran together for many years. During his over 50 years of cutting hair he not only helped many of Treutlen County’s residents look their best, but also on an occasion, cut the hair of Governor Jimmy Carter. Mr. Clark enjoyed hunting, gardening, spending time with his grandchildren and family; but also had a special love for syrup making. He was an expected figure and the syrup making authority at the annual cane grinding and community gathering held at the Robbie Hooks farm in Orianna. He was a member of the Orianna Baptist Church where he sang in the adult choir. In addition to his parents, he is preceded in death by his wife of 46 years, Rachael Wyatt Clark, who passed away in 2007 and a brother, Guy Clark. Mr. Clark leaves behind his son, Royce Clark and his wife, Jessica Horne Clark of Soperton, four brothers, Terrell Clark (Flo), Elgin, SC, Wayne Clark (Laura Dell Meeks Clark), Forest Park, GA, Carlos Clark (Mary Nell Wyatt Clark), Soperton, GA, Wade Clark (Anne Proctor Clark), Soperton, GA, two grandchildren, Mason and Marleigh and numerous nieces and nephews. Funeral services will be held on Monday, January 21, 2019 at 2:00 pm in the Chapel of Sammons Funeral Home with Reverend Arthur Conley officiating. 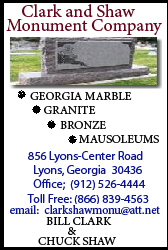 Mr. Clark will be laid to rest beside his wife in the Orianna Cemetery. Serving as pallbearers will be: Rabun Clark, Milton Ricks, Keith Clark, Robbie Hooks, Robert Hooks and Johnny Hooks. His family will receive friends at the home of his son or on Sunday from 6:00 – 8:00 pm at the funeral home.